Sunday June 22nd 1924 The Whetstones & Byingtons went to Burlington. I was in the garret all morning looking over things and put in the afternoon down stairs. It rained so they did not get home till after ten oclock. It was a hard trip. Monday June 23rd 1924 I rode to town with the girls. Did some errands I was busy at home in afternoon. Some people here looking over things in the house they can use. Down to Otts in evening. Tuesday June 24th 1924 I worked most of the day on cotton pad for my bed. Hattie home. Cora at the store. Wrote Mollie a birthday letter. Wednesday June 25th 1924 I was sewing most of the day. The girls up at the other place. Letter from Lydia. Her Mother some better. I wrote Jane and sent letter to her. Rode in evening. Very warm. 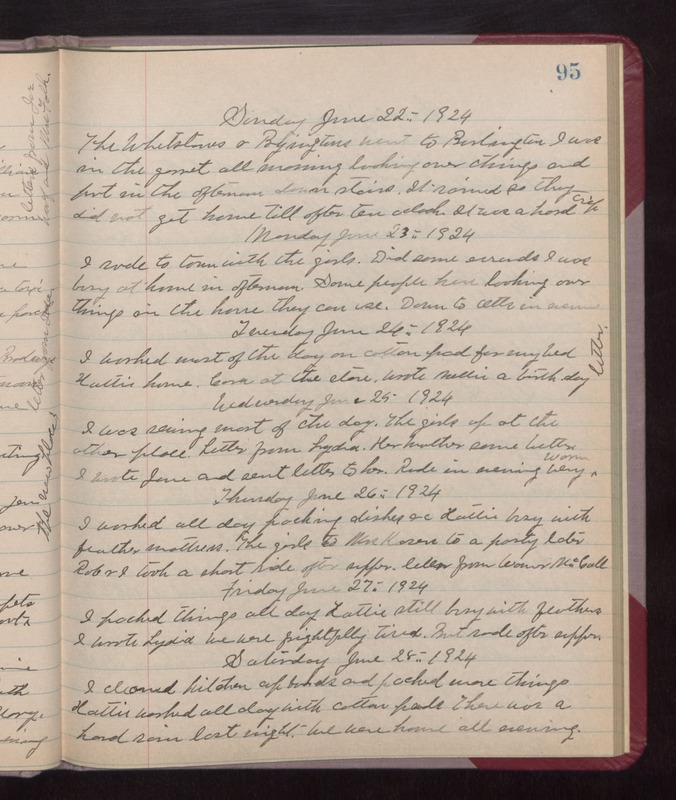 Thursday June 26th 1924 I worked all day packing dishes &c. Hattie busy with feather mattress. The girls to Mrs Kozers to a party later. Rob & I took a short ride after supper. Letter from Warner McCall. Friday June 27th 1924 I packed things all day. Hattie still busy with feathers. I wrote Lydia. we were frightfully tired. But rode after supper. Saturday June 28th 1924 I cleaned kitchen cup-boards and packed more things. Hattie worked all day with cotton pads. There was a hard rain last night. We were home all evening.